If you’re trying to lose weight, then there’s a good chance you’re looking for a 3 day diet menu. 3 day diets have been popular for decades, even before the internet came around. If you’re old enough, you might remember your friends and family passing around photocopies of the various 3 day diet menu options. Nowadays, most of us get them in email form. There are several different 3 day diets that are popular, with names like the Mayo Clinic Diet or the Cleveland Clinic diet or the Tuna and Water diet. 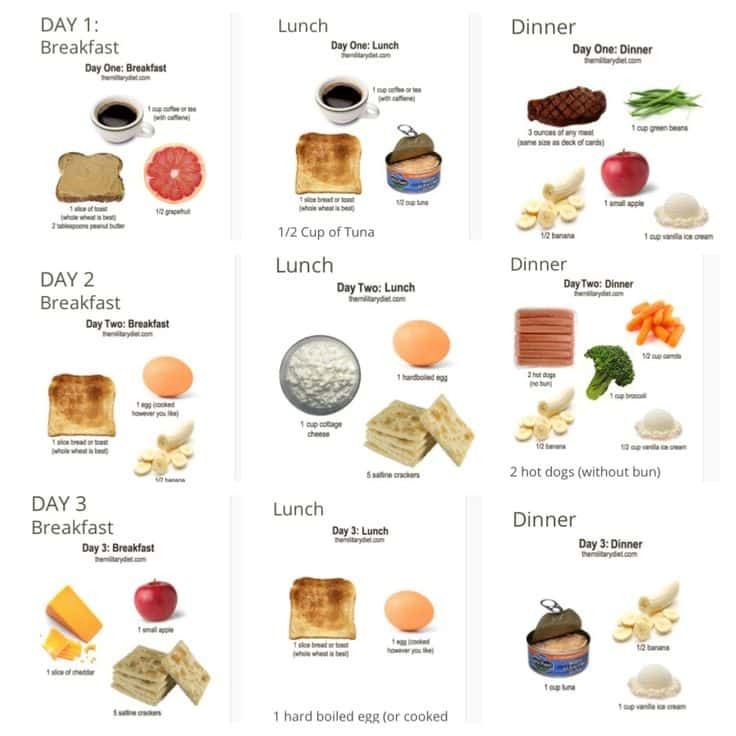 Each of these has a different 3 day diet menu, but they all work by similar methods. What most of these diets do is use a combination of low calories and low carbohydrates to elicit extremely fast weight loss, usually somewhere in the neighborhood of two pounds a day. Generally speaking, they are usually said to have originated at a medical clinic to enable heart patients to lose weight before surgery. Most of the clinics have come out and denied that they were the originators of these programs, but they remain popular because the do get results. Probably the most famous diet of this type is the one known as the Mayo Clinic Diet, or more simply as the Grapefruit Diet. This is different from the others in that, no surprise, it makes heavy use of grapefruit in the 3 day diet menu. Supposedly, the grapefruit has enzymes in it that are supposed to help speed up fat loss. While there is some evidence that this is true, the real value of the grapefruit comes from the fact that eating it before your meal forces you to eat less at that meal. Grapefruits are high in water and bulk and low in calories, which means that when you eat them they take up a great deal of space in your stomach. Because of this, you’ll eat less of other, more calorie dense foods, which means that you will eat less calories total at eat meal without feeling deprived. Aside from the grapefruit diet, the way the 3 day diet menu tends to vary is a matter of the level of carbohydrates allowed. Some of the diets recommend a piece of toast or bread at each meal, other prohibit starches entirely. Typically breakfast on these programs will consist of one of two choices. On the higher carb programs, it’s toast and peanut butter. On the lower carb programs, it’s usually going to be two eggs and some bacon. Lunch is pretty similar in that regard. The high carb versions will allow you have meat and a piece of bread or toast and maybe some fruit. The low carb ones will just have you eat meat and a salad with full fat dressing. Dinner tends to be the same for both, oddly enough. What you’ll usually be eating is meat and vegetables, and usually in fairly large portions, with dinner tending to be the largest meal of the day. The higher carb versions actually have a tendency to be lower in calories to compensate for the extra carbohydrates. A lower carb 3 day diet menu will usually be much less restrictive in calories, so the key is to choose the diets you can mostly easily stick with.